On the Thursday before Time Quest I took Bob Mitsch on a whistlestop tour of some choice locations around the easterly side of central London, followed by the westerly side the next day. 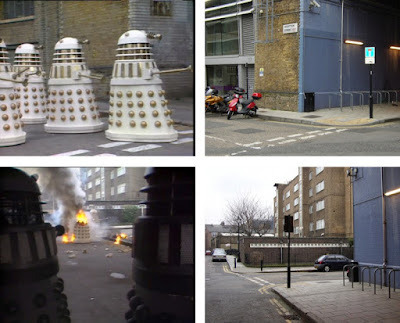 The first tour was aiming for Butler’s Wharf, the warehouses used in Resurrection Of The Daleks. 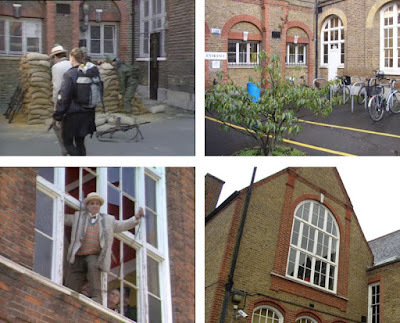 The second tour was steered towards the Cole Hill School seen in Remembrance Of The Daleks – in reality now a community centre in Hammersmith. We arranged to meet at Liverpool Street station, and was joined by Edward Miller, a McCoy fan who in the spirt of the tour was in near full costume. 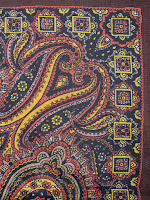 I say near full because he was missing the question-mark pullover – but not for long, as I had been asked to bring along his one from the recent Group Buying that Bob had been running. Bob did show us all up by arriving in full Tom Baker costume, resplendent with scarf and jelly babies! First stop on our tour took us past the GPO Post Office Tower (now the BT Tower) which is just off Tottenham Court Road. This was seen in The War Machines way back in 1966 (the year I was born - showing my age there!) We then took in Bedford Square, which is where The Doctor lands the TARDIS for that episode (see below). From there we walked to Forbidden Planet, the largest sci-fi bookstore in London. 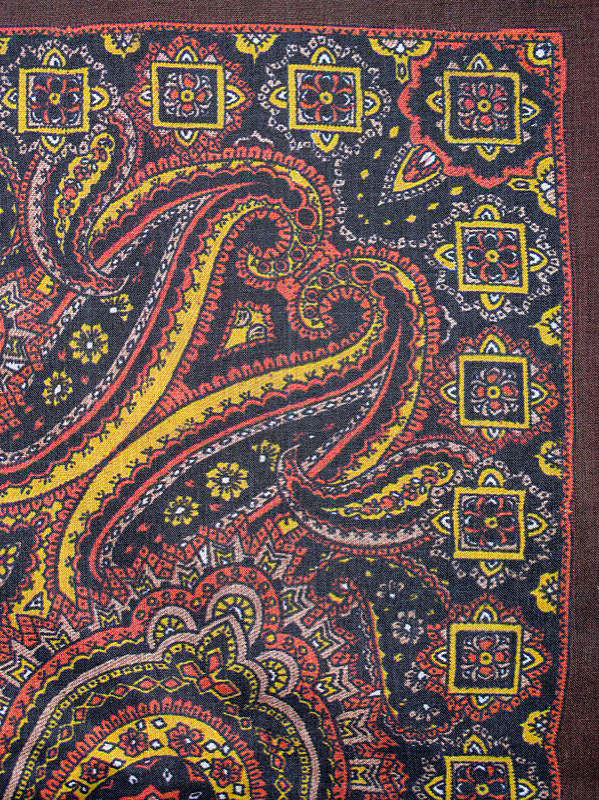 I used to go to it when it was just a single store on Denmark Street, a short walk away, but now after a couple of changes of premises, they have settled on a large two-floor store on Shaftesbury Avenue. Bob was like a child in a sweetshop: everything was new and exciting, and little of it available in the US (see right). He bemoaned the lack of such memorabilia in America, but as Ed and I reminded him, it is a British show after all! After prising him away from the DVDs, books, comics, toys, models . . .. . we took a quick fly past Soho, where many of the fabric shops I get my materials from are located. The other side of Soho brought us out at Piccadilly Circus, site of another original period Police Post. Here was also hooked up with a friend of Ed’s who joined us for the rest of the tour. We then took a shortish walk down to Trafalgar Square to see where the Daleks had trundled around in Dalek Invasion Of Earth. 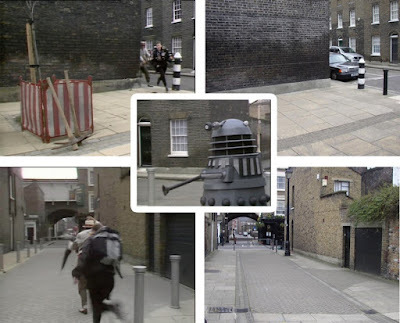 We found the exact spots used, and after getting some minor abuse from a group of boiler-suited workmen (‘Look out: Daleks!’ isn’t massively original guys, though more appropriate than they thought!). We had some fun taking pictures around the square (see right). I just love the way Bob plays tot he camera! We then took a shortish walk down to Westminster Bridge and the Houses Of Parliament, where more Daleks took a sightseeing tour, not dissimilar from our own . ..
We then hopped on a bus to take us up Victoria Street and jumped out around Westminster Cathedral. Opposite this is a road called Palace Street, that leads to Buckingham Place. Bob was keen to see this, especially Number One Buckingham Place, which had been used in 1967 as the exterior of Number Six’s London house in The Prisoner (see right). A walk to Victoria Station then took us by tube to Earl’s Court. 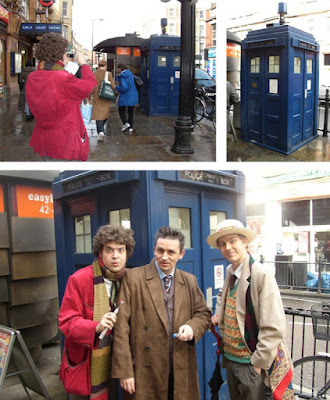 Situated the Earl’s Court Road, just outside the station, is the only full-sized Police Box in London, though it is a rebuild, not a period one. Unveiled on 18th April 1996, it was supposed to be the first of a wave of new boxes across the capital, but the plan never got past this initial site. We then took lunch – just as well as it had started to rain! By the time we finished the rain had eased and we were back on the tour, this time just a short tube ride from Earl’s Court station to Ravenscroft Park, just beyond Hammersmith. This is where the old school used in Remembrance Of The Daleks is located. But before covering that, I will just show you some other locations from the same adventure we visited the previous day. Despite being set around the Shorditch area of London (which is East, not far from the Liverpool Street area where we met up this morning) the locations used are actually all over the place! 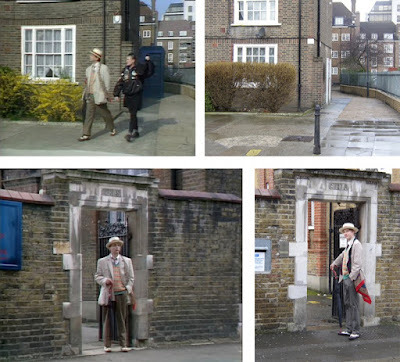 The cemetery is in Willesden Green (North London); the Totters Lane junk yard is located in Kew (South West London); the Cole Hill School is near Hammersmith (West London); and the back streets where the Daleks have a battle involving the special-weapons Dalek is actually near Waterloo (on the South Bank of the Thames). So, just after seeing the Globe Theatre, we had taken a dip into the streets used. It was odd to think the Daleks had been here . . .
Just around the corner is where The Doctor and Ace hide in a workman’s tent from a patrolling Dalek (see below). 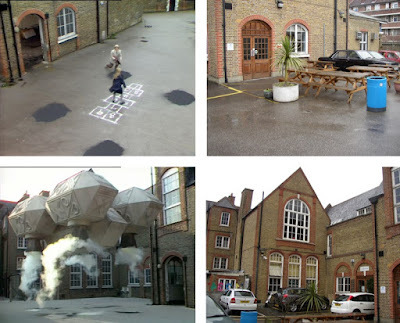 Meanwhile, back in Hammersmith . . . .
We found the school easily, to find little had really changed on the outside, and the street opposite where the TARDIS landed also looked little different. We were a little nervous about just walking into the centre, as we were not sure what sort of reception we might receive. However, a caretaker was walking his dog and he was perfectly happy for us to go around the back where the playground is located, site of the Dalek shuttlecraft landing. The way the episode is cut together, you think the playground is through the entrance in the wall, but it is actually around the other side of the building. The archway leads only to the doors where the soldiers build their sandbag gun position. 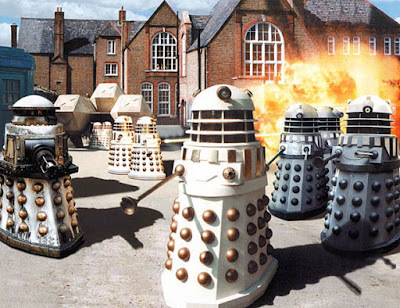 Lastly, we worked out which window The Doctor ab-sails down from to get to the Dalek shuttle. We then headed back towards Liverpool Street Station to get to the Convention venue, but not before taking in one last location, one which Bob had been dying to see, though at first I did not think there would be time. BBC Television Centre is located on Wood Lane in West London and had been where a number of the colour stories had been recorded. The building is synonymous with the BBC, and is regularly seen as the glamourous epicentre of tv production. The reality is that it is just a massively building, surrounded by tight security, so unless you have a pass or reason to go, there is little to see. It ticked one last box for Bob, so he was over the moon! Ah! I know that Edward! I've really enjoyed reading this, and the 'Then and Now' photos are extremely interesting.